The HSM Shredstar X17 Cross-Cut Shredder, which also goes by the name Shredstar X17, is a powerful shredder. It is ideal for personal use or even in small offices. The X17 operates almost silently to shred at least 17 sheets in one feed. 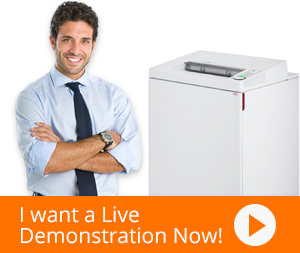 In one minute, users can shred as many as 86 sheets. It looks very compact and is portable. This feature of the X17 makes it easy to carry around. Therefore, more than one person can use it in a workplace by relocating it from one office to another. As it operates silently, it is a good machine to use in a corporate and medical setting. The HSM Shredstar X17 is not only a paper shredder. It also shreds CDs, DVDs, credit cards and other plastic cards. The HSM Shredstar X17 has a separate slot for shredding CDs and DVDs and a separate waste unit. The Shredstar X17 is designed to prevent an overload. Therefore, it has an automatic start and stop mechanism. This means that whenever the machine is overloaded due to excessive paper in the cutting cylinder it can stop working. The cutting cylinder has a lifetime warranty, which makes the HSM Shredstar X17 Cross-Cut Shredder a very recommendable shredding machine to keep in offices where there is the need for shredding large amounts of paper. The machine notifies the user to reduce the number of sheets to 17. The Shredstar X17 has an LED indicator that tells the user the machine's status. If the waste container is full, the user can see it at a glance and empty it. The waste bin can contain as much as 6.9 gallons of waste. The machine also has an inbuilt anti-jam technology. This automatically reverses the paper in the machine if it is jammed or overloaded. It is available in both white and black color. The best part about using the X17 is that it is very user-friendly and safe to keep at a workplace. Maintaining it is very easy and it consumes less power. Therefore, small and medium business enterprises should use the X17.